When religions of old pointed to the God found in the sun, they were speaking about the Logos through whom all things became. Different names were given to this being. One religion that immediately preceded Christianity tried to prepare the way for the coming of this God, namely Mithraism. Once Christianity was established, it lost this connection to the cosmic Christ in favor of the earthly Christ. 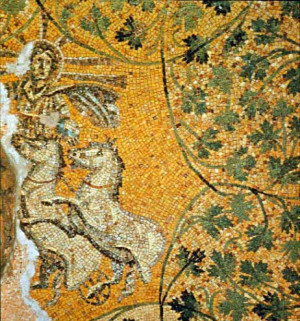 But the mosaic shown here, from St. Peter’s Basilica, shows the cosmic Christ as the charioteer of the Sun. The approach of this God was experience in the ancient mysteries. Preparation meant overcoming one’s “Bull”. These ancient priests had an incredible knowledge of the stars and a sophisticated knowledge of the fixed and moving stars. They knew that if one followed all the majestic forces that flow from these sources and from the earth as well, one can grasp not the human but the bull. Only with the additional forces of the sun, could they grasp the meaning of the true human being. Meaning, of course, comes from the Logos. To overcome one’s bull, involved inner strength to overcome the body’s influence on one’s soul (and lower self). 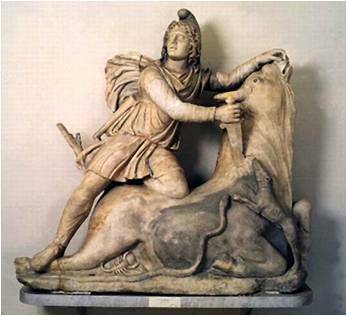 Associated with this bull, we see in this sculpture three creatures. What do these represent? Remember that Christ was crucified with two others through whom individually both Lucifer and Ahriman spoke. Lucifer, in ancient art, has typically been depicted as the serpent while Ahriman is the hound. But who is represented by the scorpion? This completes the unholy trinity and its name is confusing as some traditions revere those spiritual beings with this name: Asuras. What is meant is those beings who are of the Archai level but have not met their own progress in past planetary conditions and thus act as a hindrance in our Earthly planetary condition. As weights are a hindrance to lifting objects, they strengthen us in our spiritual forces. So Mithraism intended to make straight the way to the Cosmic Christ. Arius brought this cosmic Christ perspective. 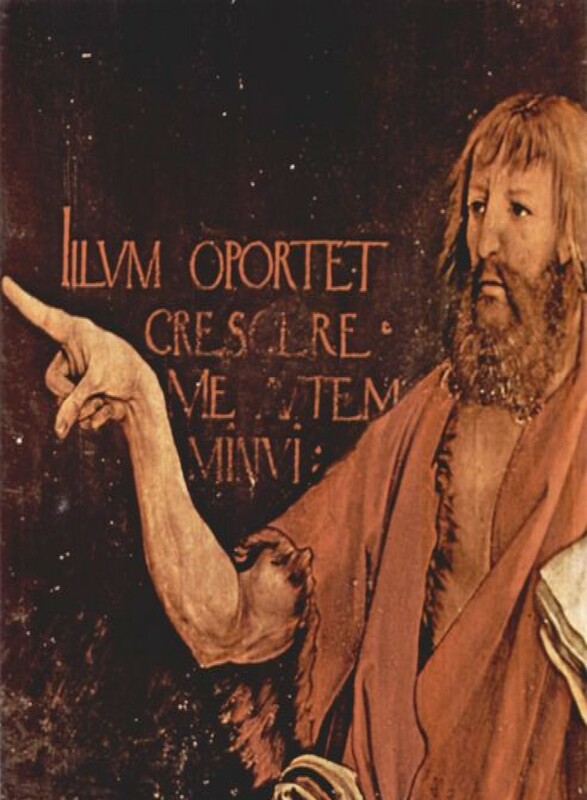 But by the 4th Century, Western Christianity had focused entirely on the earthly Christ and rejected the way of using the ancient mysteries to understand the Mystery of Golgotha.